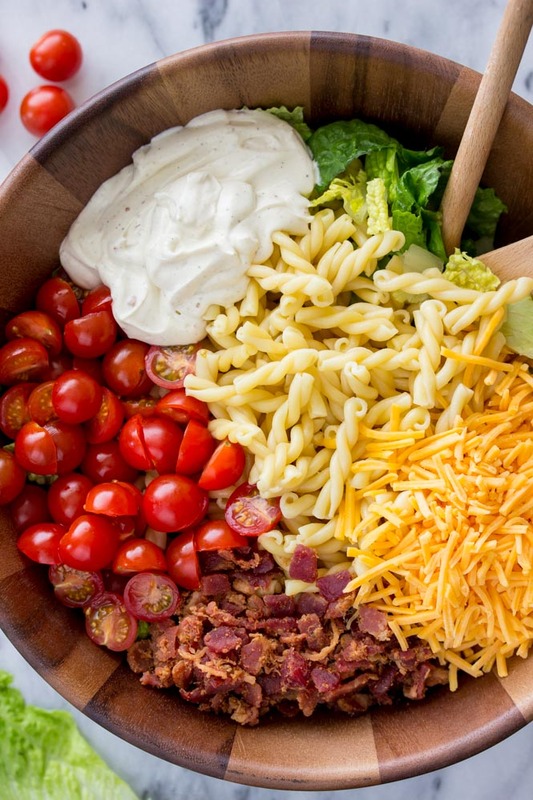 An easy and unique pasta salad, this BLT pasta salad is made with plenty of bacon, lettuce, and tomatoes and covered with a mayo based dressing. 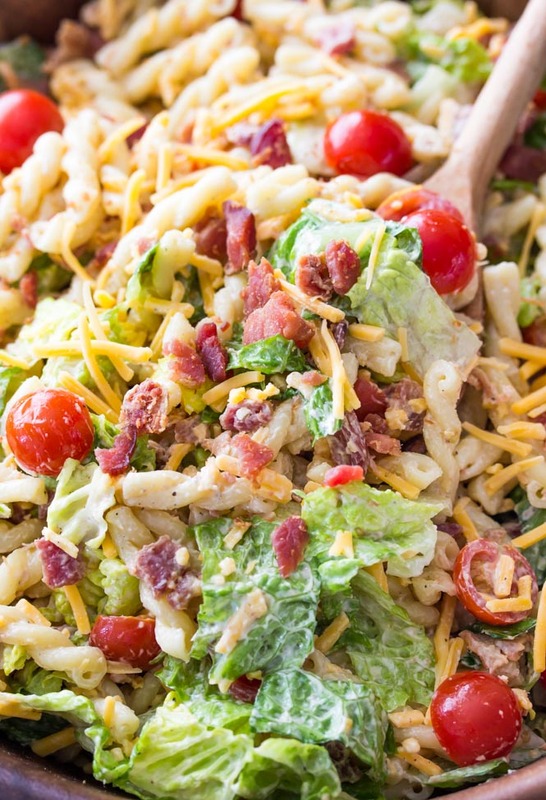 Every bite of this BLT pasta salad makes me feel like I’m at a picnic. Somewhere warm with summer-fresh produce surrounding me, freshly cut grass, maybe a picnic table with a red-checkered paper tablecloth. BLT pasta salad brings me back to warmer (better) days without fail, and even if it’s not summer when you’re reading this and the best tomatoes you can get your hands on are of the supermarket variety, this salad does not disappoint. It’s an explosion of flavor, and a new twist on your classic BLT sandwich. Like the sandwich, it’s quite simple to make, but it doesn’t even require you to cook your own bacon (more on that later). If you can pick your own, all the better, but these little beauties above are from the supermarket, so store-bought works just fine. 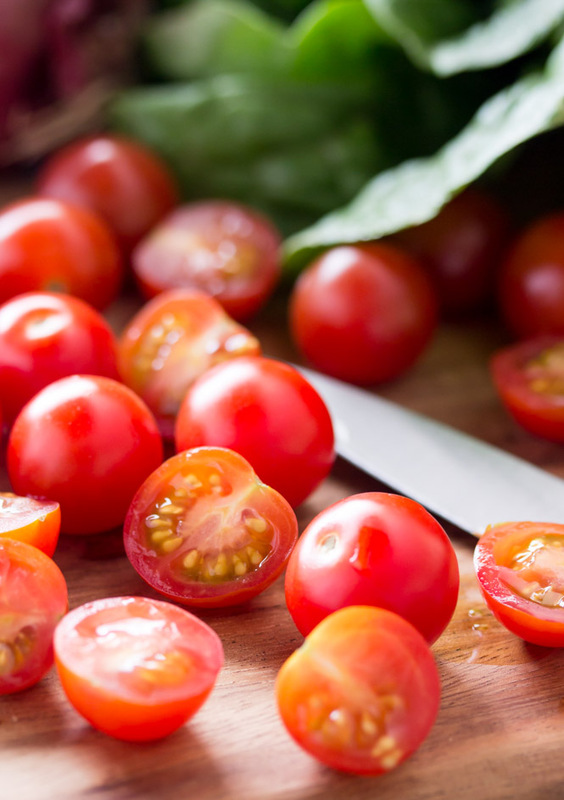 Grape tomatoes are great because they can be quickly and easily sliced in half, but if you can’t find them, Romas will work just fine, sliced into bite-sized pieces. 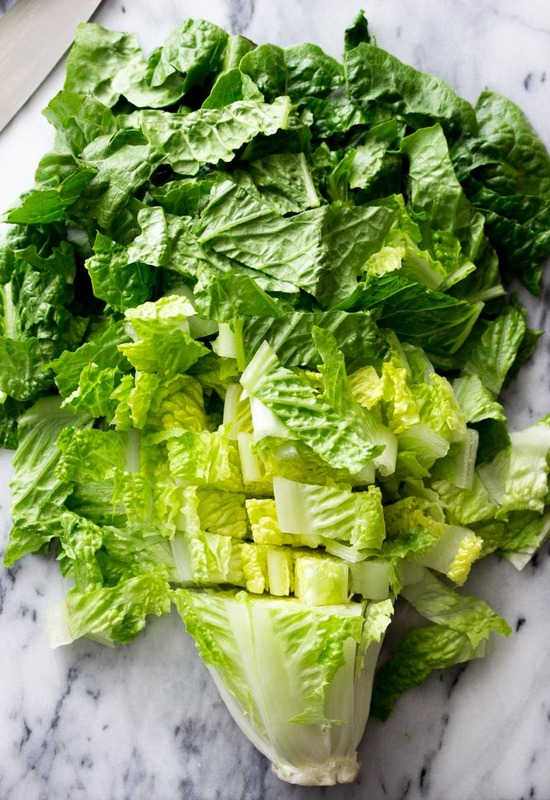 You’ll need 3-4 cups of chopped Romaine lettuce. I buy it and cut it myself because it’s cheaper, but it obviously takes a little more time. If you don’t mind spending a few extra pennies, you can buy a 10-oz bag of pre-cut, pre-washed lettuce. If you opt to cut your own, make sure to pat it dry with paper towels before adding it to your salad. Now that you’ve prepped your produce, prepare your pasta according to the instructions on the box. I used “Gemelli” shaped pasta because I liked the way it looked, but rotini or even macaroni noodles would work just as well. While the pasta is boiling, prepare your dressing. Now, if you don’t want to make your own dressing, you can absolutely substitute one cup of Ranch dressing instead. This dressing is very easy to make, though, and you probably have everything you need handy. 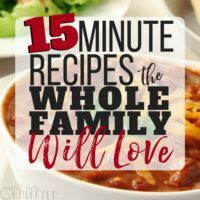 It’s made of a mayonnaise base, amped up with a touch of sour cream, and then seasoned with salt, pepper, and other spices. Stir it up nicely and set aside. Once your pasta is done boiling, strain it well. Now, you are going to need a large bowl to combine your ingredients. Lettuce (patted dry), grape tomatoes (sliced in half), cooked pasta, a simple homemade dressing, and cheddar cheese all go into the bowl. But don’t forget about possibly the most important part — the BACON. You can fry your own bacon, pat it dry, and crumble it. You would need about 12 or so pieces for this BLT pasta salad. Or, you can do what I do, and buy pre-cooked, crumbled bacon. Not artificially flavored bacon bits, but real bacon bits or pieces. 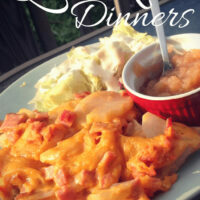 You can find them right by the salad dressing (the brand that I used for this particular recipe was Hormel). You can do pieces or bits (just smaller pieces), whichever you prefer, but while I used the pieces for the photographs here, I actually think I preferred the bits — smaller pieces of bacon, but more in every bite — your choice! Once you’ve got everything in the same bowl, mix it well and serve it up! Keep any uneaten salad (unlikely!) refrigerated in an airtight container. 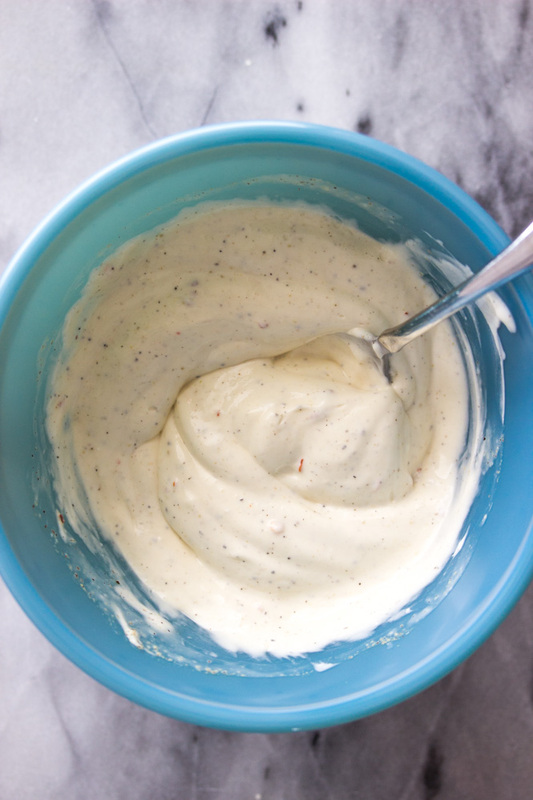 Prepare the dressing by stirring together mayo, sour cream, milk, pepper, salt, garlic powder and crushed red pepper (if using) until smooth and well-combined. Set aside. Prepare pasta according to package instructions. When finished cooking, drain well and transfer to a large salad bowl. Add chopped lettuce, grape tomatoes, cheddar cheese, bacon bits/pieces, and your prepared dressing. Toss/stir very well, until ingredients are well-combined. What's your favorite pasta salad recipe? 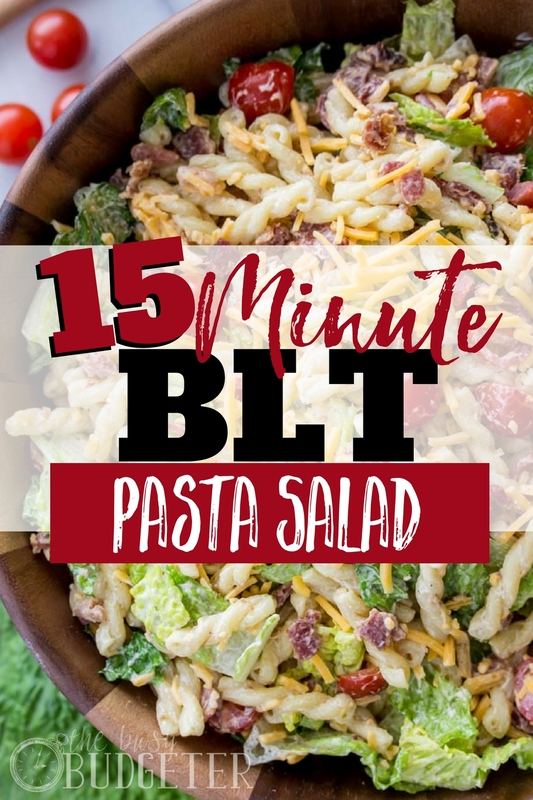 Have you tried this simple BLT pasta salad with your family? Leave a comment down below! Love your ideas ! Thank you so much ! I’m not usually a pasta salad fan but this looks exceptional! Yum! This sounds delicious! I have been experimenting with avocado mayo recently…have you every tried using it? Heather recently posted…Try making homemade hummingbird food! Ill definitely be taking this on my next hunting trip! We just ate this for lunch and everyone enjoyed it (even my 3 1/2 year old and 5 year old)! I made the pasta, cooked the bacon, shredded the cheese, and threw together the sauce on Sunday so all I had to do today was halve the tomatoes and add the lettuce. I highly recommend using spinach if you don’t have romaine on hand. Also, keep the lettuce completely out if you think you might have leftovers. Each person can put a bit of spinach on their plate first and then scoop some pasta salad onto it. Could I substitute plain Greek yogurt for the sour cream in the dressing? Yes! I’ve only ever used plain geek yogurt and it’s delicious. I am making for a ladies craft day, and I plan to add grilled chicken to make it more hearty. Love the idea of the spinach and wait to add it and the lettuce till later.Thanks! Sounds delicious! How many does this serve as a main course salad, please and thanks! 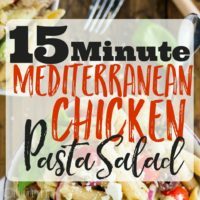 Thanks for a great recipe…it’s my new go-to pasta salad! I was at my daughter’s babysitting the grands and we had gotten all the stuff at the store to make this. Honestly, as we put it into our mouths, it was the best thing I had tasted in a long time. We were all hoping to have leftovers for the next day but that never happened. Three adults and 1-9-year old grandson ate the whole bowl. Of course I fried a whole pound of bacon in a cast iron skillet and fried it up the old fashioned way and I think that is what made it so good.. I sure wishmy husband would try new things but he is such a wus. I will be making this every chance I get! I’ve made this salad several times now and each time everyone loves it. I recently made for my sister who is laid up with a broken leg. After one bite she declared” this my go to salad from now on”. I’ve used the dressing recipe for fresh veggie dip also.